i love holidays! i love the crafts, the food, the decorations, and the celebration. i try not to go overboard adding decorations each year because i have so much already, but i do like to add one or two things for each holiday. 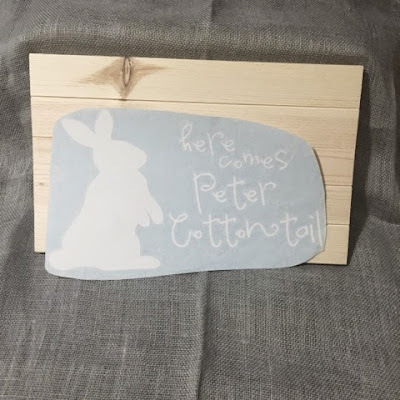 after my glitter shamrock project, i wanted to make something similar for easter, and i still want to... i saw this sign at the wood craft store (wood connection). it was the perfect simple addition to my decor this year. this project is a little different than vinyl projects i've done before. the vinyl is more of a stencil. my decor is pretty simple this year. the holiday is so early. i have a few more crafts to make throughout the year to be all ready for next year. sometimes i like crafting on opposite seasons. do you ever do that? try it. it's kind of nice. So cute!!! Hopefully I can find time to make something cute like these! :) You are so crafty! I love this so much! 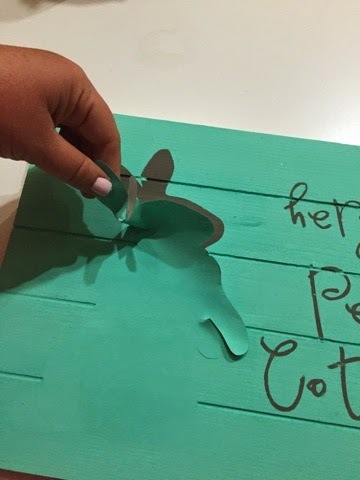 I recently got a silhouette and have been trying to find all the inside tricks to making cute stuff like this! Thank you for sharing! I love using vinyl as a stencil, I do that more often then I use the actual vinyl, lol. And I love the color you picked! So bright and pretty! I LOVE it! Super adorable!!!! Very cute! I love the colors you used too!